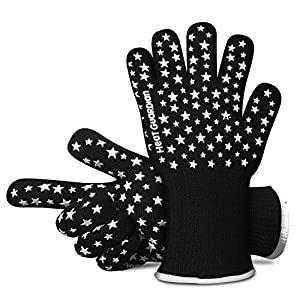 Versatile Hand Gloves: From removing pans from the oven to handling food on the grill, our Heat Resistant Gloves manage to withstand intense heat! Fast and convenient, they act as pot holders, heat trivets and even allow you to rearrange hot logs in the fireplace. Hand and Forearm Safety: By providing a non-slip grip, our Heat Resistant Gloves allow you to handle a wide range of items without fear of dropping them. They also feature a 5″ cuff, keeping your wrists and lower forearms protected from high temperatures! Comfortable and Easy-to-Use: Strong enough to protect your hands, yet flexible enough to allow easy finger movement, these heat gloves provide a great fit and unmatched comfort! Simply slip them on and you’re ready to handle just about anything.